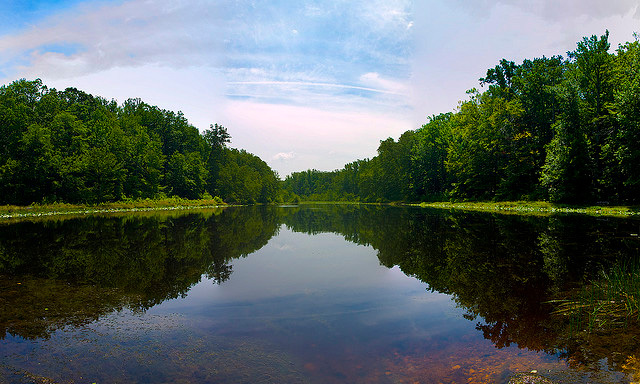 A pond at Cedarville State Forest in Waldorf, Maryland; photo by Watson Media on Flickr (use permitted with attribution). The nine-stanza poem was written by a native of Maryland; James Ryder Randall in 1861. Randall was teaching in Louisiana in the early days of the Civil War, and he was outraged at the news of Union troops being marched through Baltimore. The poem articulated Randall's Confederate sympathies. Set to the traditional tune of "O, Tannenbaum," the song achieved wide popularity in Maryland and throughout the South.